Soulprint was all kinds of awesome. And I'm so glad that I read it. When I first heard of it, I knew I had to read it, because I adore Megan Miranda. She is amazing. And I thought this new book of hers sounded amazing. Then I saw it on NetGalley; was so happy when I got accepted to read it. <3 So glad I loved it. I like both the UK and the US cover editions of this book. For my review I'm using the UK edition, as this is the one I got accepted for via NetGalley. <3 But yess. I need to buy them both. As I really enjoyed this book and I need to own it as well. And, yeah, the covers are pretty gorgeous. Which the inside is as well. I knew I would like Soulprint, but I didn't know how much I would like it. And I liked it a whole lot. First, the writing is pretty amazing. Which is a big plus for me. I found the story to be all kinds of exciting. And I adored reading about all the characters. 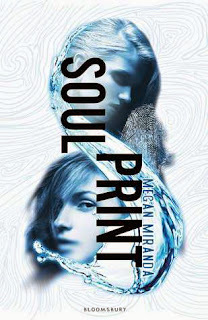 Soulprint is a different book. And I loved reading everything in it. I'm not going to explain the plot to you, because it is all kinds of awesome, and you should definitely read it for yourself. But yess. I adored reading about it. It is about soulprinting and it is different and exciting and I loved learning the reasons for everything. Most of the book is about the characters, though, and not the world it is written in. Which I liked. Though I would also have loved learning more about the world, research and everything. But at the same time I loved that this book was more focused on all the characters. Soulprint is told from the point of view of seventeen year old Alina. Whom I adored reading about. But oh. My heart also broke for her, because she have lived her whole life trapped on an island. She has a house, and just about everything she wants, but she is also alone. She cannot leave. She cannot talk to anyone. People work there with her, but only for a month, then they are gone. And my heart just. It is so sad. And I adored reading about Alina. Because she is strong. And sweet. And yeah. I just loved her. This book is about Alina escaping. Escaping from the island that traps her. From the people who are holding her there. Which, there is a reason for. Which has to do with the whole soulprinting. Because Alina's soul was the soul of June. Who did terrible things. And people are afraid Alina will continue these things, though she remembers nothing about her soul belonging to June before she died. Anyway. It is all kinds of complicated yet not when I read it. So I shall not say more about it. Just, it's very awesome. There is so much happening in this book. And I couldn't begin to talk about all of it. There is running from people. Running with people. Lots of hiding. Yet also lots of amazing characters. I adored reading about Cameron. And Casey. And they are both all kinds of awesome. There is also Dominic, whom I didn't like at all. Hmph. But also. There is romance. And there is not a triangle of any sorts. The romance is slow yet real and I adored it to pieces. There isn't much of it, but it's so sweet and I loved it. I'm not sure my review is making a lot of sense. As I want to explain this book better, but my head won't let me. Which is just all kinds of mean. But I'm trying. I'm trying to tell you how much I enjoyed this book. How awesome the writing is. How amazing all the characters are to read about. Their history is all kinds of perfect. And I just loved everything in this book. Okay, I had a few small issues, which is why it's a four star and not a five star, but that is just because I felt like I could have loved it even more. I'm not going to say much more about this book. Just that I would have loved a sequel. So much. Because there is more that I need to know. More about Alina and Cameron. And Casey too. And curious to know if more happens with the plot. And Alina's parents. I need to know. I need to know what happens next. Ack. But anyway. I adored Soulprint. It was an amazing story and I cannot wait to read it again. It is full of action and exciting moments. Some really cute romance too. It is just all kinds of awesome. I've never heard of this one before either. But I'm glad you enjoyed reading it. Sounds really interesting. This sounds like one that I could enjoy too. I'm so happy to hear that you loved this one Carina, it sounds like a very intriguing book! I also requested it and I hope I'll get approved for it! This book sounds fantastic! You sold me at sweet romance with no hint of a love triangle. But the entire concept of this girl trapped on an island for something her soul did, but she doesn't remember. I'm very intrigued! Do you know if this is a standalone, or will have a sequel? Sounds like there's room for one. Thanks for sharing dear!